Reliance Jio had put telecom operators into defensive position before its commercial launch. Now that the 4G services of Reliance Jio have been commercially rolled out on September 1, telecom operators are surely going to be in more defensive position to retain their customers. And, in a bid to counter Reliance Jio, BSNL has announced that it will be offering unlimited data to its customers for ₹249. 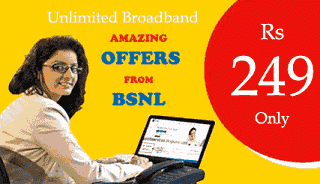 BSNL has announced its new plan called “Experience Unlimited BB 249” under which the new customers will be able to download 1 GB of data at a speed of 2 Mbps every month. And after that 1 GB of data is consumed, customers will be able to use unlimited data at a speed of 1 Mbps for the rest of the month. This is a promotional wireline broadband plan for new home and business customers which can be availed between September 9 and October 31. After this plan is availed, customers will be able to use it for the next six months at a charge of ₹249/month. However, after six months, customers will be moved on to the regular plans according to their preference. Besides offering unlimited data in their promotional plan, BSNL will also let customers make unlimited free calls to any network between 9 pm and 7 am everyday.